Whether it's a business function or a social gathering, take advantage of over 2,000 square feet of meeting space. From banquets, wedding receptions, private parties, or a holiday bash, we'll help you take care of everything – down to the last minor detail. 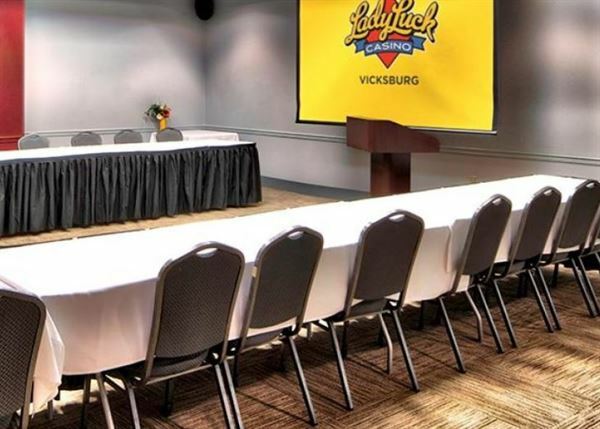 Save precious time and money when planning your upcoming event at Lady Luck Casino Vicksburg with our professional meeting services staff. Whether it's a business function or a social gathering, take advantage of over 22,000 square feet of meeting space. With breakout rooms for smaller meetings or gatherings, we can accommodate groups up to 1,100. Our staff is ready to assist you in planning your next event. From banquets, wedding receptions, private parties, or a holiday bash, we'll help you take care of everything – down to the last minor detail. Save precious time and money when planning your upcoming event at Lady Luck Casino Vicksburg with our professional meeting services staff. Whether it's a business function or a social gathering, take advantage of over 2,000 square feet of meeting space. With breakout rooms for smaller meetings or gatherings, we can accommodate groups up to 100. Our staff is ready to assist you in planning your next event. From banquets, wedding receptions, private parties, or a holiday bash, we'll help you take care of everything – down to the last minor detail.